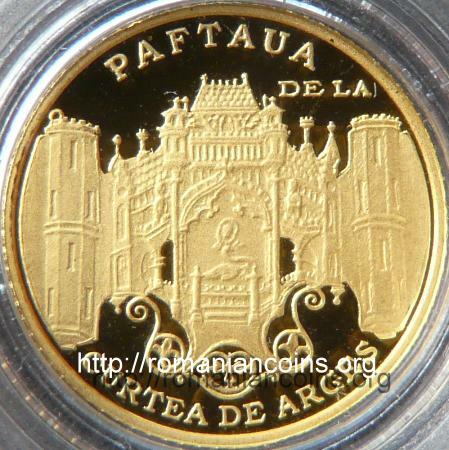 Obverse: face value 10 LEI, coat of arms of Romania, year 2010, ROMANIA, Princely Church from Curtea de Argeş Reverse: gold buckle discovered inside the church of Curtea de Argeş and inscription "PAFTAUA DE LA CURTEA DE ARGES" meaning "BUCKLE OF CURTEA DE ARGEŞ"
The princely church Saint Nicholas of Curtea de Argeş is very old, being dated around year 1352. Customarily, the building was erected on the place of an older church. The church is also represented on the silver 10 lei 2009 dedicated to the 650th Anniversary of the Establishment of Walachia's Metropolitan Bishopric. In 1920-1921 the Romanian archeologist Virgil N. Drăghiceanu performed excavations inside the church, under the aegis of the Commission of Historical Monuments (Comisia Monumentelor Istorice), and he discovered several unspoiled princely tombs. The buckle has 269 grams, is 110 millimeters in height and 182 millimeters in width . Outermost the buckle shows two hexagonal towers, and at center the gate tower of a fortress. On the sides of the central tower lie constructions featuring one balcony each. A man and a woman are placed into the balconies. A woman-headed swan is placed on a blue enamelled plaque. Under the roof of the central tower there are two trilobate signs - interpreted as three waterlily leaves . These signs looks very similar to a trilobate element that can be found on several seals of Sibiu from the 14th century - so the hypothesis that the buckle was manufactured at Sibiu (Hermannstadt, in German) is a natural one. The man represented on the buckle is considered to be Louis the Great, king of Hungary (1342 - 1382) and of Poland (1370 - 1382). The woman is considered to be Elizabeth of Bosnia Kotromanic, the second wife of king Louis of Hungary, daughter of Stephen II, Ban of Bosnia, and descendand from a Polish king. The swan with human head is considered to be the heraldic sign of the queen . The fortress on the buckle was identified with the fortress of Visegrád , capital city of the Hungarian kingdom in the 14th century - named Plintenburg in German. The coat of arms of the city is very similar with the image of the buckle of Curtea de Argeş. The city of Visegrád still exists today. It is placed on Danube River, 40 kilometers upstream from Budapest. Who owned the buckle? Who was burried with this exquisit adornment? It is quite probable that the buckle was ordered by king Louis the Great and offered as gift to Vladislav Vlaicu - possibly on the occasion of an oath of fealty . In spite of the fact that the buckle was discovered many years ago, the interpretation of the symbols was only quite recently done - in 2008 - by Mr. Georg Schoenpflug von Gambsenberg. He presented his findings under the form of a contest, on a forum dedicated to the city of Sibiu . 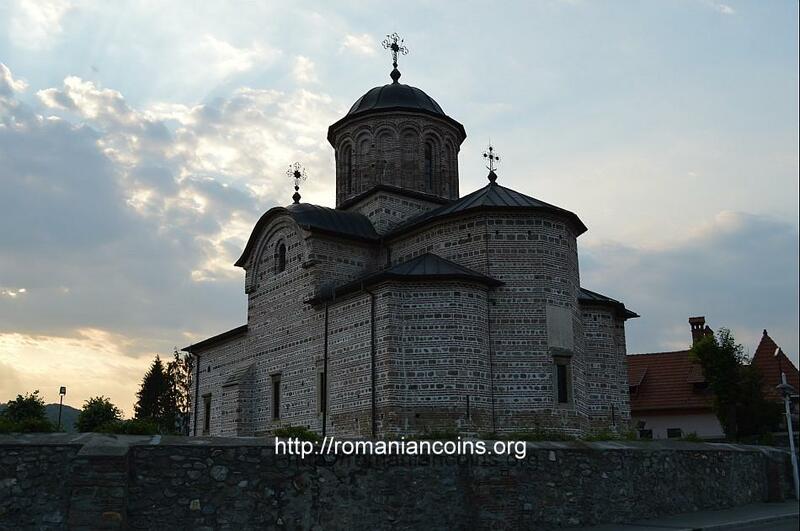 Constantin C. Giurescu and Dinu Giurescu  show that the popular tradition affirm that Basarab I of Walachia and his son Nicolae Alexandru were burried at Cîmpulung, so the rich tomb discovered into the princely church of Curtea de Argeş belongs to one of their successors. Giurescu opined that the tomb could be the tomb of Radu I, based on the argument that this voivod is the first listed into the "pomelnic" of the church (a list of names of dead predecessors and of their relatives remembered = pomeniţi in Romanian - during requiem masses for their repose). 1. Burda Şt., Tezaure de aur din România. 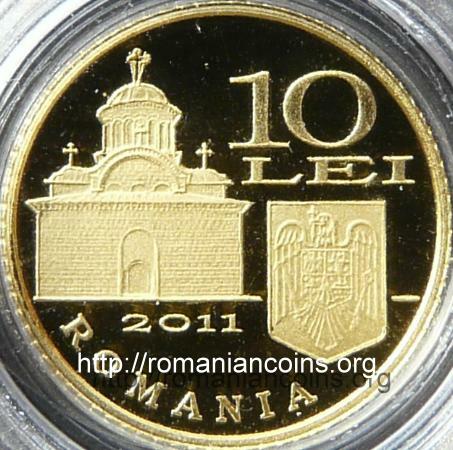 (Gold Hoards from Romania, in Romanian) Ed. Meridiane, Bucureşti, 1979. 2. Giurescu C., Giurescu D., Istoria românilor. Vol. 2. (History of the Romanians, in Romanian) Editura Ştiinţifică şi Enciclopedică, Bucureşti, 1976. 3. Schoenpflug von Gambsenberg, G., (2008, 27 ianuarie), Rebus-Labirint-Istoric Pentru Oricine (Important: Imagini!). (in Romanian) Sibiul.ro Forum, retrieved on 14th of December 2012, from http://www.sibiul.ro/forum/viewtopic.php?f=2&t=2460. The History of gold series comprises four pieces of 500 lei from 2001 (featuring the golden cache of Pietroasa), three 100 lei coins from 1999 (and from 2002 and 2003 too) with the Dacian helmet of Poiana-Coţofeneşti, from 2003 with an eagle from Apahida, from 2004 with the Cantacuzinian engolpion and several of 10 new lei from 2005 with the Perşinari hoard, from 2006 with the Cucuteni-Băiceni hoard, from 2007 with the rhyton of Poroina, from 2008 with the Hinova hoard, from 2010 with the Someşeni hoard, from 2011 with the buckle of Curtea de Argeş and with the cross from Dinogetia and from 2012 with the patera from Pietroasa Hoard.